The Choupette brand received 2nd degree "the Shop of Year" at the "Golden Bear" National award in the sphere of goods and services for children. More than 100 companies from the whole country and the neighboring countries which presented nearly 200 goods-nominees in 22 nominations participated in the competition "Golden Bear". 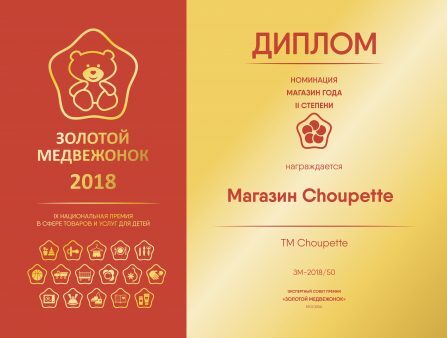 It should be noted that this year Anastasia Vasilkova, the development director of TM Choupette, for the first time was included into advisory council who were carefully estimating performances of nominees of an award for 4 days. The "Golden Bear" National award was founded by AIDT in 2010 and is the conventional award. The award encourages consumer qualities of products and services, the highest merits of the companies and leaders of the industry.